Linzi Miller has been playing guitar and drums from an early age. She began teaching herself guitar at age 12 and then took up lessons from guitarist Stuart Gorman who is well known in the music industry and is one of Scotland’s top players. 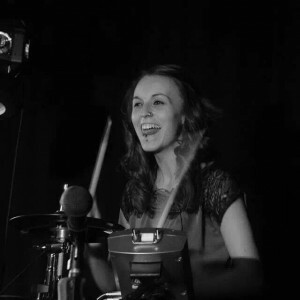 Linzi took up drums at age 14 and taught herself to play to a high standard. She went on to study drums as her first instrument at James Watt College where she received tuition from one of Scotland’s top drummers Hugh Cox. Linzi graduated from James Watt College with an HND in Music and went on to study her degree at Perth College UHI (University of the Highlands and Islands) and gained a BA in Popular Music Performance. She has been teaching guitar and drums for over 11 years now and has experience in many aspects of the music industry such as live performance, touring, session work, studio recording, songwriting and working with all different kinds of people; kids, adults, oap’s and people with learning disabilities. Linzi currently plays drums in Scotland’s most talked about band The Ronains who have just recently returned from an American tour of the East Coast playing in Baltimore, New York and Philadelphia. They are a 4 piece new wave rock band and have just released their first LP titled “Love, Drugs & on the Dole”. You can find out more information on The Ronains by visiting their Facebook page. Linzi is endorsed by Natal drums and currently plays a 5 piece Cafe Racer kit. She is featured on their website and highly recommends the Natal brand to all students. Linzi tailors her lessons to suit you. You will learn correct technique, posture, music theory, a range of musical styles and Linzi will also teach you any songs that you would like to play for fun! She is experienced with teaching all age groups and levels and has a great deal of experience teaching larger groups of students as well as one-to-one. Don’t hesitate to contact Linzi today to discuss any questions you may have about guitar or drum lessons, she is a very enthusiastic and friendly teacher who enjoys her work and will go that extra mile to ensure you get the most out of your lessons at Miller School of Music.